Diwali has finally arrived and Saudawala visitors are gearing up to shop till they drop. Be it clothes, footwear, Homecare, Healthcare- shopaholics can avail best online shopping offers in delhi, ncr only through Saudawala which is the best online daily deals and n-commerce site in the region. We have got all what it takes to make the most of every single occasion. Picture this- Diwali is a festival most people wait throughout the year very impatiently for, since it allows them to clean and paint their homes, buy new household and home care items, new clothes, gifts, sweets, illuminate their houses with innovative lights, jewellery and most preferably fireworks and crackers. This is what we are here for. You name it, you get it. We bring you the exciting free deals, discounts and offers from an extensive range of consumer care categories and products, all near you. There are several categories with Saudawala that you can choose from this Diwali. We have Fireworks, Lights, Home care, Electronics, Gifts, Sweets & Namkeen, Gems & Jewellery, Apparels, Watches, Handicrafts, Boutiques & Tailors, Footwear and so many more categories that you can pick from. All the local and high-street markets are illumined with glittering lights and are full of life, this is what a shopper experiences when he visits a real marketplace. That’s not all! If you opt to visit a market through us, you get yourself enviable free online shopping deals in delhi, ncr. Keep a bucket full of water near you at all times. Do not put water on any electric wire or system that has caught fire, use sand instead. Children should be attended closely by their parents and elders. Burn crackers in an open space and follow the instructions of elders. Do not put on outfits made of silk and loose clothes; prefer cotton and fitting dresses instead. Do not burn crackers/fireworks near petrol pumps, hospitals or religious buildings. Care for others as much as you care for yourself. 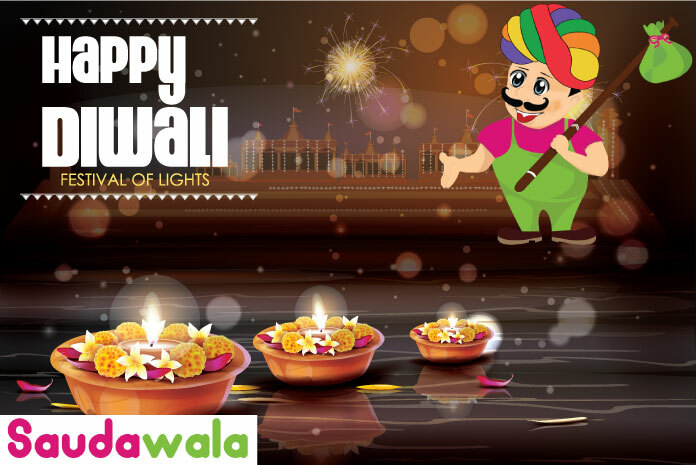 The Saudawala Team wishes you all a very safe and happy Diwali.